Pizza sauce is an element that acts as a complement, an enhancer if you will, to the rest of a pie's ingredients. The ideal pizza sauce has substantial flavor yet doesn’t overpower the rest of the ingredients on a pizza. Purists insist simple is best, using only the best tomatoes, a pinch of salt, and maybe some fresh basil. Others say the best sauce starts by simmering onions with herbs and needs hours to cook down on the kitchen stove. In this blog we’ll take a look at the different types of pizza sauce and how to prepare one. Tomato Based (red sauces) – These are probably the most common and classic sauces found on pizzas. Red sauces almost always contain tomatoes as a base ingredient along with (but not limited to) onions, herbs, garlic, and olive oil. 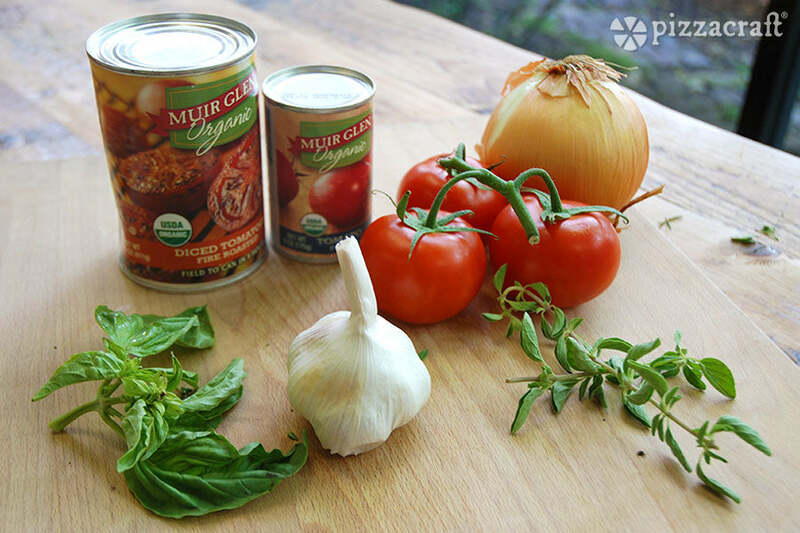 Tomato sauces work well with a wide variety of ingredients. Milk or Cream Based (white sauces) – White sauces have become a very popular second choice because they offer a nice change of pace from traditional red sauce. These sauces also pair well with many ingredients and cheeses. Typically (but not always) they start with a thickener like flour and butter (roux) and use milk as the bulk liquid. White sauces work best with subtle or bright-flavored ingredients like chicken, lemon, artichokes, and squash. Oil Based (pesto, olive oil and garlic) – Oil based sauces can be both simple and complex. Sometimes these sauces consist of only oil, garlic, and herbs - while other times there are more complex flavors like a basil pesto or roasted garlic sauce. Specialty (spreads, salsas, non-traditional sauces) – The items on this list use the term “sauce” rather loosely. Some of them, like salsa, come close to the consistency of a red sauce; others like marscapone, hummus, or barbecue sauce resemble more of a spread. These specialty “sauces” may get some weird reactions from pizza fans, but they’re typically used to match a very specific flavor profile like a barbecue chicken pizza or a Mediterranean pie (with hummus). Give these pizzas a chance! You might end up really enjoying them. Now that we’ve covered the basic types of sauce and what they’re typically used for, let’s take a look at a couple of recipes. 1 can fire-roasted tomatoes, 14 oz. Add oil to a medium-sized sauce pot and set over medium flame. Once olive oil is hot, add onions and sauté until fragrant. Add garlic and sauté another 15-20 seconds until fragrant. Reduce heat to medium low, then add tomatoes, herbs, salt and pepper and simmer 8-10 minutes until flavors combine. Remove from heat and transfer to a food processor or blender. Pulse mixture few chunks remain. If consistency is too thick, add a small amount of water and adjust salt/pepper as needed. This recipe is from our Pizzacraft cookbook, Pizza: From Every Day to Gourmet. *Walnuts can also be used if pine nuts are unavailable. Combine basil, garlic, pine nuts, and oil in a food processor or blender. Pulse until coarsely chopped. Add the cheese and briefly pulse until evenly incorporated. (Do not purée mixture, texture should not be completely smooth). Transfer the mixture to a mixing bowl and season to taste with salt and pepper. Recipe yields approximately two cups of sauce. Neopolitan Herb Blend: This blend was formulated with the pizza purist in mind and made with garlic, onion, and a few simple spices. Try some pizza sauce with this blend and you’ll have all your guests asking for the secret recipe. Spicy Calabrese Herb Blend: Need a little kick in your pizza sauce? The Spicy Calabrese herb blend is the perfect mix to pack a little punch in your tomatoes. This mix contains garlic, chili pepper, red and green bell peppers, paprika, and onion. Tuscan Herb Blend: The Tuscan herb blend is a bit of homage to the flavors of Italy. Onion, garlic, sun-dried tomatoes, and just a touch of chili pepper round out this herb mix to add the perfect amount of flavor to your sauce. The best part is that these herb blends also work well in soups, pizza dough recipes, focaccias, and lasagnas. Combine olive oil with your favorite vinegar and add just a touch of any of these three blends for a tasty focaccia or breadstick dipping sauce. Even roasted vegetables or your favorite grilled meat can benefit from a touch of any of these three herb blends. Whatever your flavor style may be, there’s a sauce out there for you. Enjoy these recipes and feel free to experiment with your own twists on ingredients. Why add oil in pizza’s sauce?